I do the majority of cooking at home since I’m married to a chef. Most of the time it’s because he’s not home. But what about the times he is home? What is it like to cook for him? Let’s answer a question with some questions, shall we? Let’s look at what it’s like when I DO cook for him. Does he critique your cooking? Yes. Not every meal, but if he thinks there is something I could have done differently, either with the preparation method or flavor, he will make a suggestion. He always does it in a kind way and sometimes I end up laughing as I watch him figure out how to say it nicely so it doesn’t hurt my feelings. It’s not a job interview. It’s just dinner. Do you get nervous if he’s watching you cook? Honestly, he rarely watches me cook. If I’m cooking and he’s around, he usually ends up just coming up and taking over. I’m totally fine with this. He’s obviously a much better cook than I am. However, when he is watching me, occasionally I’ll get comments like, “Do you need help over there?” This usually means he’s concerned about my safety or he can tell that I’m frustrated. But no, I don’t get nervous. What happens if you really mess up the meal? He can fix it!! He’s a chef, remember. This came in very handy when I used the wrong wine last Thanksgiving to braise the dark meat of our turkey. More on that another time. It’s still too painful to think about . . .
Have you ever made something your chef/husband refused to eat? What about you? 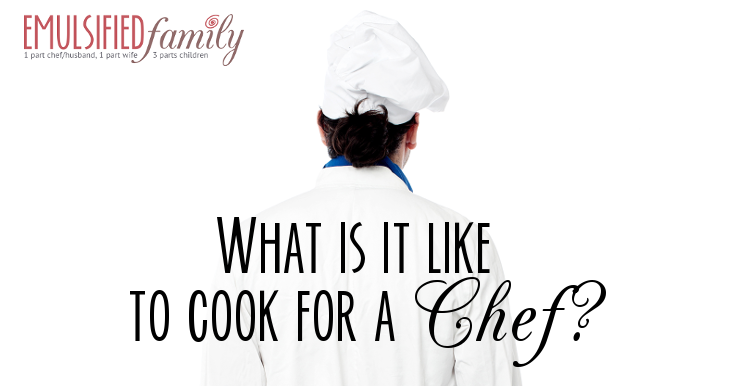 Have you ever been nervous to cook for your chef? Leave a comment below and let me know! I never have really given it much thought about cooking for my hubby. He is just grateful that he isn’t the one cooking. I do however get upset with him when he pours pepper or sriracha on something I make before trying it as I fixed it. Try it first before altering it, please. Why is it that hot sauce goes on everything? They always want others to try their food before adding salt or something else. That’s so funny! Cooking for my chef makes me nervous. I have been known to be a good cook, the person my friends would like to have cook a meal for them or a cake/dessert for a party. But after moving in with my chef my culinary confidence tanked! He just does everything so much faster and better! I started ruining even basic things like toast! Once my sandwich bread even cut his gums because he very kindly tried to eat it anyway and tell me it was just fine! But when he isn’t around I cook just fine. So if I am to be making our meal I usually try to plan to do the cooking while he is out and time it to be ready when he walks in the door. I did recently manage to make a really wonderful mediterranean dish with pan fried sand dabs and 3 veggie sides while he was home that turned out quite well…so maybe my confidence is starting to come back, fingers crossed! I actually didn’t even think about it the first time I cooked for my chef. Of course, I cooked it while he wasn’t home and it was just finishing when he arrived. Our best meals happen when we cook together. We have so much fun in the kitchen. It’s a wonderful time to reconnect and destress at the end of the day (granted he’s not closing). Sometimes he will “doctor” what I’ve started, I’ll jump in and make one thing while he makes the other, or (and this is the best) he’ll fix me a drink pull up a chair in the kitched and I get to watch him cook. It it the most attractive thing for him to do, I could watch him chop in amazement for hours! That’s great that you cook together!! Watching them chop things is amazing, isn’t it?? I love that too!